The month of June is full of endings and new beginnings with graduations, new father's, and of course summer vacations. You would think the time would get slower and more manageable, but instead it can be more stressful! 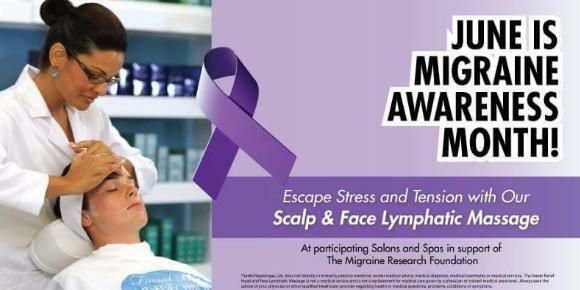 Whether you suffer from pesky headaches every once in a while or a continuous victim of full on migraines--we are bringing awareness to Migraine Awareness Month, JUNE! All month long, we will be offering complimentary Scalp and Lymphatic Massages (15-20 min) to ease tension and drain pent up lymphatic fluid. You can book these services as a stand-alone appointment or during your other professional hair & skin services. Get the most of your time with us this month while learning more ways on how to prevent and treat headaches this summer! We can't wait to see you soon and treat you like the royalty that you are!